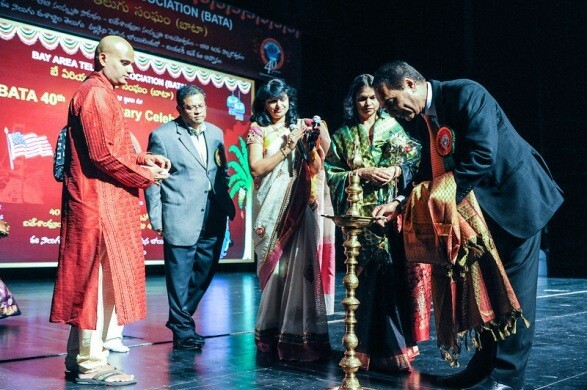 Press Note : BATA’s 40th Anniversary Celebrations Cultural Extravaganza – A Grand Success! 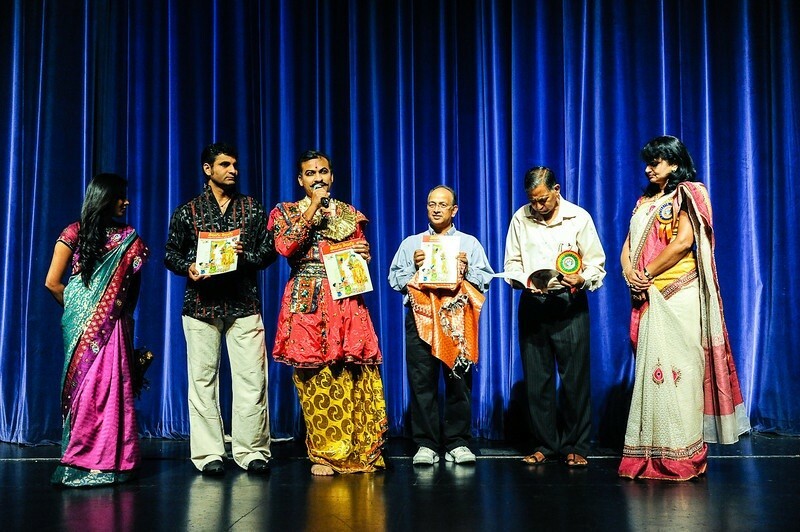 Bay Area Telugu Association’s (BATA) 40th Anniversary Celebrations held on April 7th, 2012 at Flint Center Cupertino, California, was a grand success with spellbound Cultural programs. The memorable celebrations that began at 9:00AM in the morning and continued till the midnight; it was a thirteen-hours long cultural marathon showcasing BATA’s 40 years of cultural, community, and social services mesmerized the guests. There were more than 2500 guests witnessed and enjoyed the cultural program throughout the day. A mega LED Backdrop (very rarely seen in the Bay Area regional events!) with superlative effects & transitions provided a theatrical and 3D experience which captivated the guests at the event. 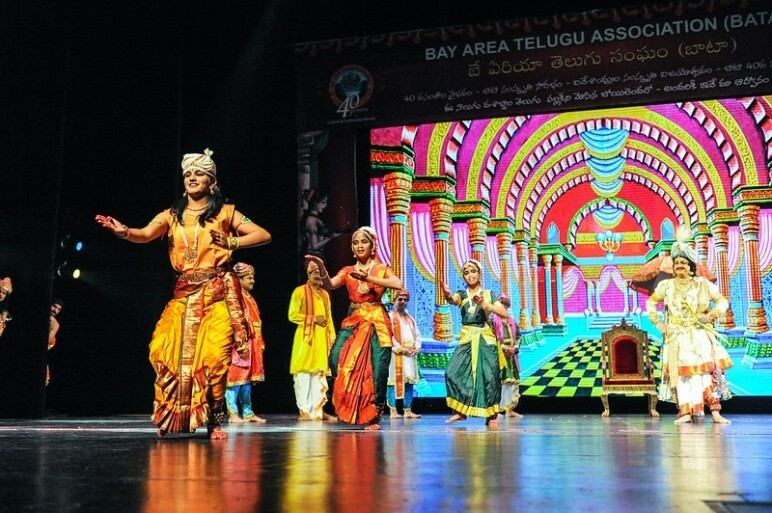 Through the lifetime of BATA and other such Telugu events in the US, this event will remain as a HISTORICAL land mark. Years of love and support from the bay area community has helped BATA reach its 40 year old organization mile stone! 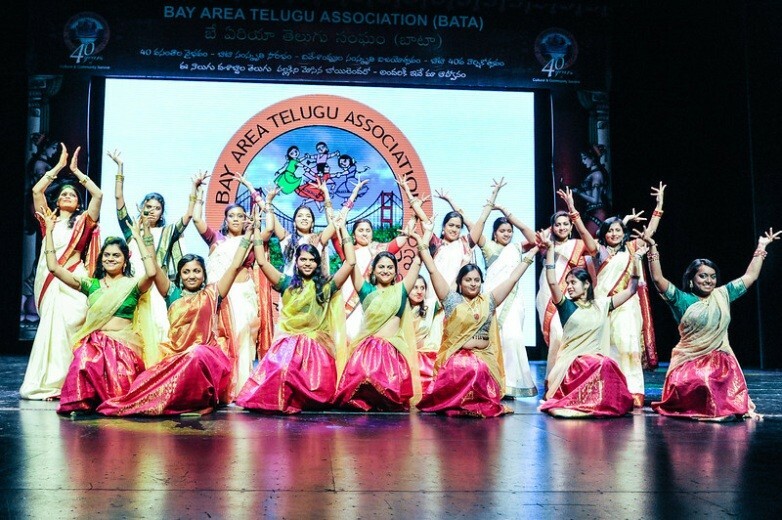 BATA is recognized as one of the foremost and vibrant organizations in the country, and has reached several thousand people of Telugu origin in the Bay Area alone. The 40th anniversary started with a grand banquet on April 6, 2012 at San Jose Airport Garden Hotel, San Jose, CA. The venue was decorated with grace and artistry in the leadership of Raghavamma garu, Jhansi Thiruveedhula, Sridevi Pasupuleti, Surekha Shetty and other BATA volunteers. Over 400 guests including several past committee members of BATA have attended the banquet making it an intimate family reunion of past and present committee members, volunteers, and supporters. Many of the past committee members shared their memorable experiences and wished BATA a bright future. Anu Natarajan (Fremont City Vice-Mayor) was the Chief Guest at the Banquet, and she commended BATA’s 40 years of glorious efforts and contributions to the community. 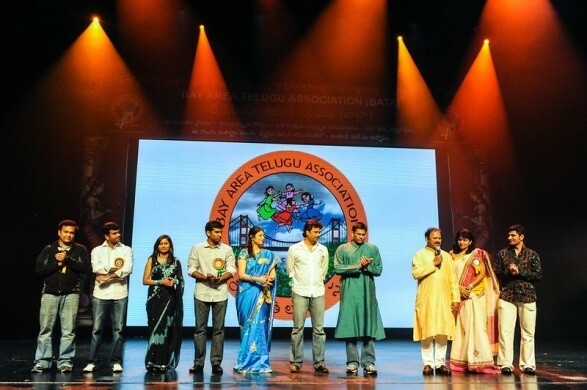 From TANA team, Jayaram Komati, Sateesh Chilukuri, Veeru Vuppala, and Hema Rao were among the dignitaries. Dr. Romesh Japra (President of Federation of India Associations) speaking at this event congratulated BATA on celebrating 40 years of service. Dr. Yella Venkateswara Rao garu, Dr. K.V Satyanarayana, and Tollywood singer Revanth were among the dignitaries at Banquet. 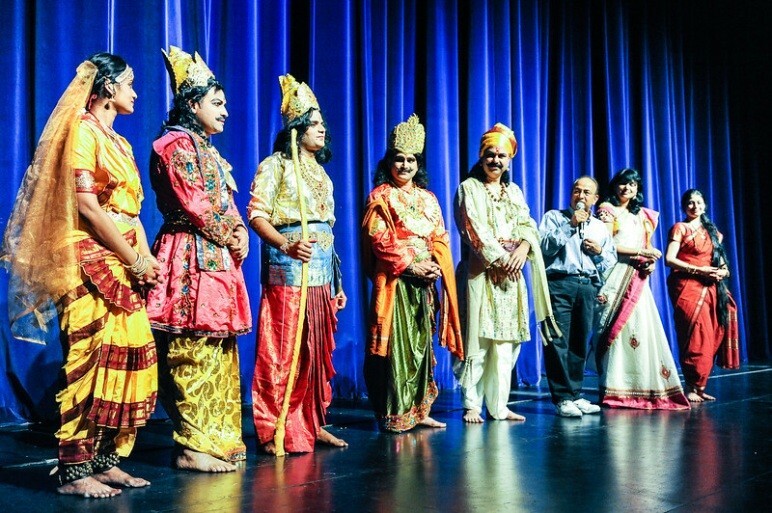 Musical night by local Bay Area talent (Ravi Gudipati, Narayan Raju, Sudha Sastry, Krishna Rayasam, Prasad Mangina, Usha Gubbala & Nitya Kasturi) was the main attraction. 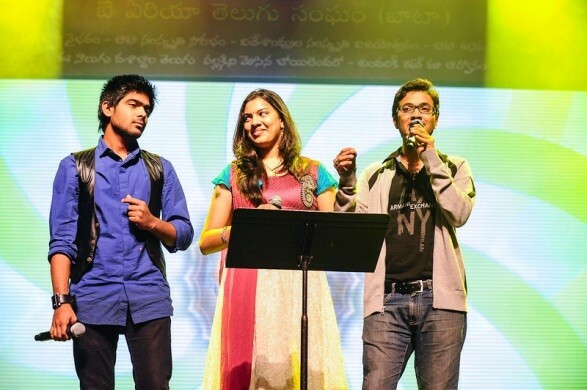 Revanth sang “Ganesh Stuti” on popular public demand. The 40th anniversary celebrations started on April 7th at Flint Center. The vicinities of the venue were decorated with beautiful statue of Telugu Talli, flowers, various arts, designs and red carpet at the entrance that created a grand festive and welcoming atmosphere. The main stage was decorated to reflect 40 years of BATA, and LED display on the stage as a backdrop created an elegant and dynamic atmosphere. Credit goes to Hari Chikoti and Kalyani Chikoti for bringing the grandeur to the stage by artistically programming the LED backdrop to project most fitting designs and animations for each of the plays on the stage. The highlights of the program are as follows. 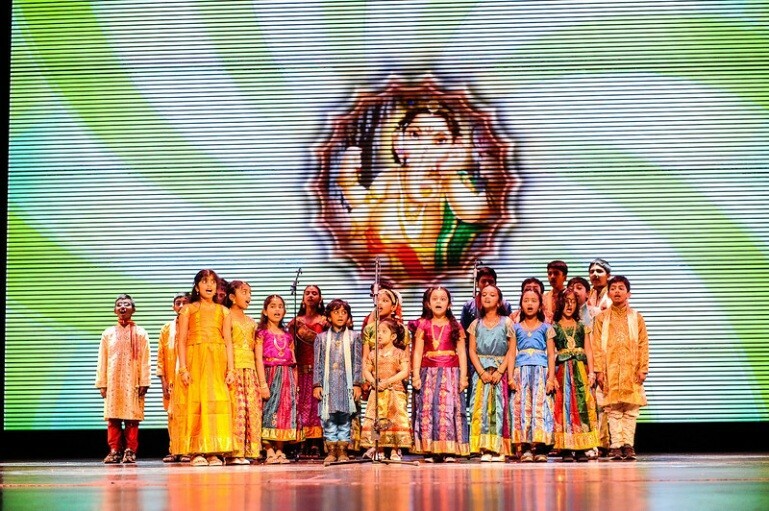 As part of the main celebrations, youth talent competitions were held in which over 200 children participated to showcase their talent in classical, folk/ film singing and dance. As in the past, there was an overwhelming response to these competitions. The competitions started at 9am and went till 6pm nonstop. Rajesh Chavali managed the registrations and conducted the competitions. There was also a free Health Fair coordinated by Dr. Sireesha Battula. Several other local doctors (namely, Dr. Chinnakotla, Dr. Narra, Dr.Velukuri, Dr. Sripathi, Dr.Tummala, Dr. Vuppala, Dr. Hanmanth Raogaru, Dr. Indira Reddy, Gayatri, Lavanya Sripathi, and Kaiser Permanente, and Palo Alto Medical Foundation) have generously volunteered their time to provide cholesterol & BP tests, Dental advise, and Preventive care advise at the site. The main-stage program started at 1:30pm. Vijaya Aasuri (BATA advisor & cultural chair) invited all the attendees and thanked the Telugu community for their continued support. The program started with a welcome prayer song “GANESHAYA DHEEMAHI “by students of Smt. Gayatri. 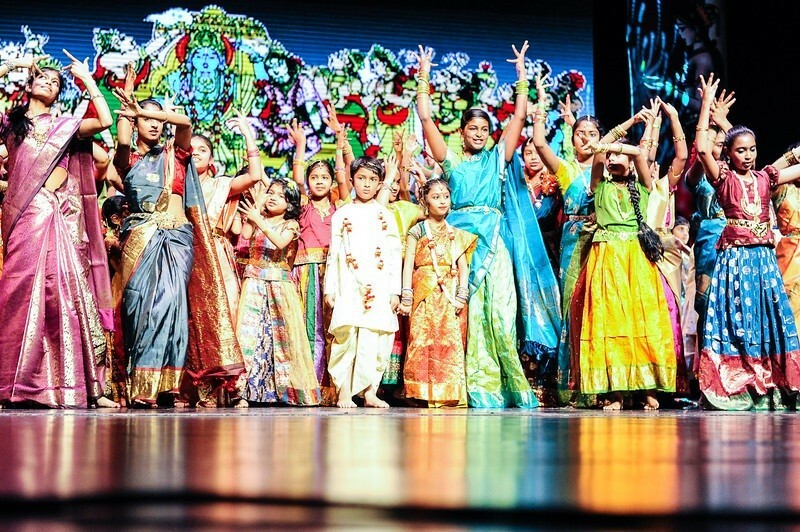 Followed by this was a creative Kuchipudi dance by SWAGATAM KRISHNA – SRIKRISHNA NRUTYA KELI Kuchipudi Dance performed by Nrityananda school of Kuchipudi Dance. These two programs provided an exciting starting to the great evening. 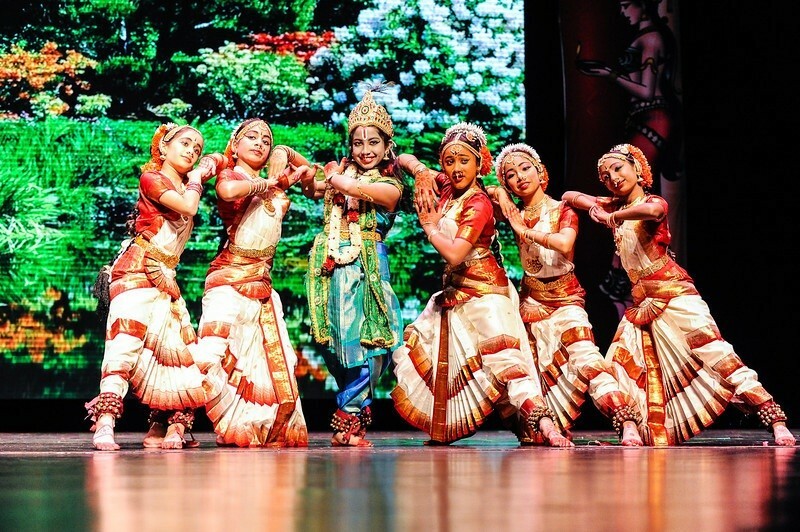 Then the MALLARI by Mythri Natyalaya Dance Academy and KUCHIPUDI NRUTYAM and BRINDAVANAM kuchipudi dance plays by Natyalaya Kuchipudi School of Dance students gave a deep sense and gratitude towards the Kuchipudi. With the little ones and youngsters dancing to old and news songs for the program called NADU – NEDU (Patha-Kotha Patala Samelanam), one could see the stirring of nostalgic feelings of guests listening to songs and witnessing the dance to popular old and new songs which created laughter and love and memories of past and present. There were over 70 students participated in this item. Then came the much awaited and talked “NARTANASALA – Mythological Play” by BATA artists which stood as one of the great highlights of the program. The costumes, makeup, script, situational LED backdrops, action and dialogue delivery by all participants were just awesome and the crowd responded with thunderous applause. This play was written & directed by Gorti Brahmanandam, and Narsimha Rao Pasumarthi played an integral role in putting this together. The next item was a very creative Kuchipudi Ballet “AMUKTA MALYDA” by Dr. K.V Satyanarayana (accompanied by students of Kuchipudi Arts Center-Sunitha Pendekanti) generated a great round applause by all guests. 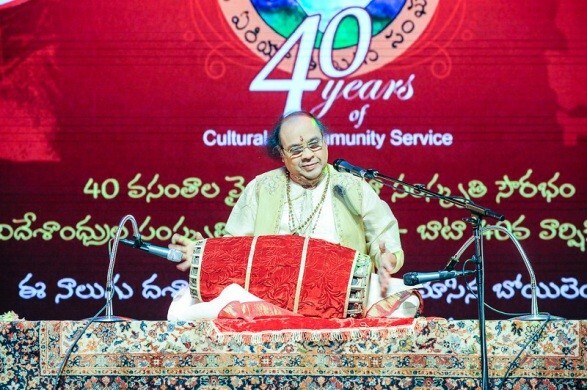 It was extremely gratifying to have Dr. K.V Satyanarayana performing on the stage. In the pack of traditional programs listed above, a hilarious comedy play, “MILK BOY”, which is a parody of current day telugu movie industry created a lot of laughter. The script was written and directed by Kalyan Kattamuri who is known for cutting edge comedy skits. The play gripped audience in the hall till the end. Just before the dinner break, Dr. Hanimireddy Lakireddy released the 40th anniversary special souvenir and he congratulated BATA for reaching the milestone. Souvenir editor Mr. Prasad Mangina thanked all the writers, sponsors & volunteers for their contributions. 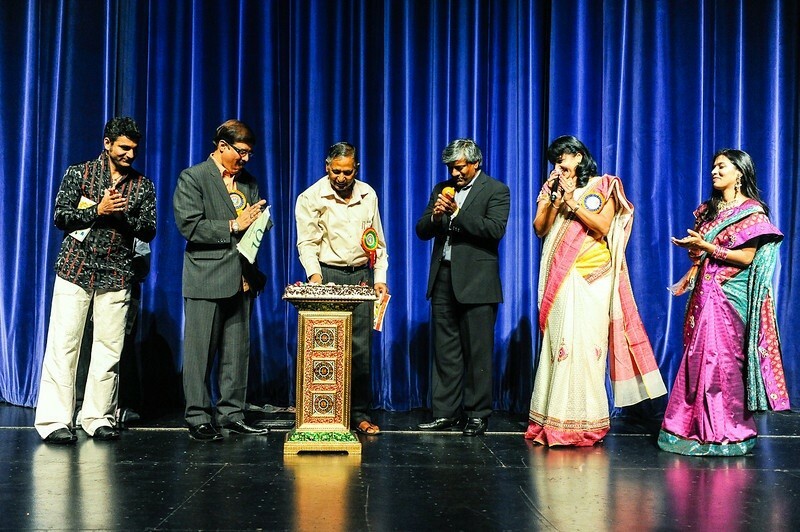 The first global Telugu Newspaper in US ‘Telugu Times” also celebrated its ninth anniversary on stage on this occasion. After the dinner break, the evening program started with “Aasirvadam” by Priest Marapalli Venkata Sastry. The traditional lighting of the lamp at the inauguration ceremony of the evening program was lit by Honorable Consul General of India in San Francisco N. Parthasarathi. Mr. Parthasarathi started his speech in Telugu that mesmerized the audience. 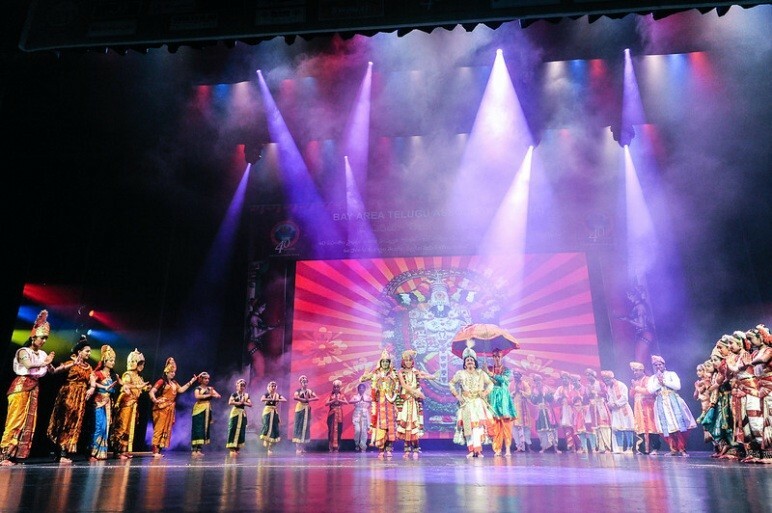 During his speech, he commended BATA for its relentless voluntary, community, and cultural services to promote Indian culture and heritage for last 40 years in the Bay Area. On this occasion, Mr. Parthasarathi inaugurated the First unofficial website (http://bata.org/site/cgi) in Telugu which provides Indian Consulate information in Telugu. Mr. Parthasarathi really appreciated BATA’s efforts in developing this website. This site was single handedly developed by BATA team. 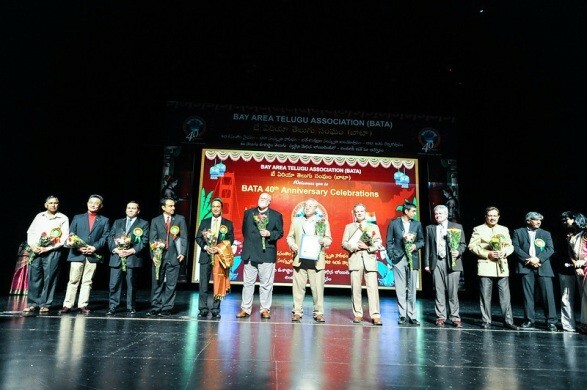 Many VIP dignitaries and local government officials attended the program and applauded BATA leadership team and the Bay Area Telugu community for their contributions to the Bay Area. Earlier in the day, Cupertino City Vice-Mayor Orrin Mahoney, Cupertino City Council Member Rod Sinks and Board Member of Cupertino City Chamber of Commerce Mahesh Nihalani presented Proclamation to BATA commending BATA’s 40 years of community service. Later in the afternoon, Member of Congressman Mike Honda, Assembly members Jim Bell, Paul Fong and Nora Campos, Former Deputy Assistant Secretary of Commerce, Obama Administration Ro Khanna, Fremont Vice Mayor Anu Natarajan, San Council members Ash Kalra, Kansen Chu, Xavier Campos and Santa Clara County Supervisor Dave Cortese, Cupertino City Council Member Rod Sinks are some of the well noted leaders in the community attended the event and provided their support and the various certificates and resolutions presented to BATA at the celebrations. Among the VIP dignitaries were Dr. Hanimireddy Lakireddy – Cardiologist & well know Philanthropist, Jaya Ram Komati – TANA Past President, and Dr. Romesh Japra – Cardiologist & President of Federation of Indian Associations. 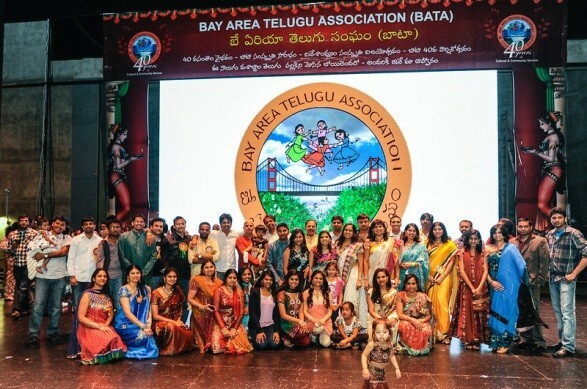 All the dignitaries highly applauded BATA for its relentless volunteer work with entire Indian community in the Bay Area through different means. The evening cultural programs started with dance ballet “Swagatanjali” (BATA Swagatha Geetham) which was specially composed for BATA for this event by TeluguOne.com. BATA would like to thank TeluguOne.com and Arjun for their help with this song. Next to follow was the main hightlight of the whole program. “Mrudanga Vinayasam” by Padmasri Dr. Yella Venkateswara Rao garu. The audiences were spellbound by the “maestro’s” magic with the instrument and gave a standing ovation to Dr. Yella. The BATA committee members and Honorable Counsel General N. Parthasarathi honored Dr.Yella garu for his outstanding performance. Sai “Psychuk” accompanied Dr. Yella on Keyboard. Srirastu Subhamastu Kalyana mastu “Teluginti Pelli” with cute little kids & teens was the next to follow. It was a dance musical skit and the more than 100 kids participated in this program. It mirrored “telugu vaari” rich marriage traditions. Popular Tollywood actress “Parvathy Milton” attended as surprise guest and even danced to couple of songs. Lalla Laahiri “Dookudu Paatala Sandadi” included some high energy dance to recent hits performed on the stage by BATA youth members. Next to follow was “Raasaleela – Radha Krishna Pranaya Leela”, it was choreographed by Padmasri Raja Reddy & Radha Reddy. 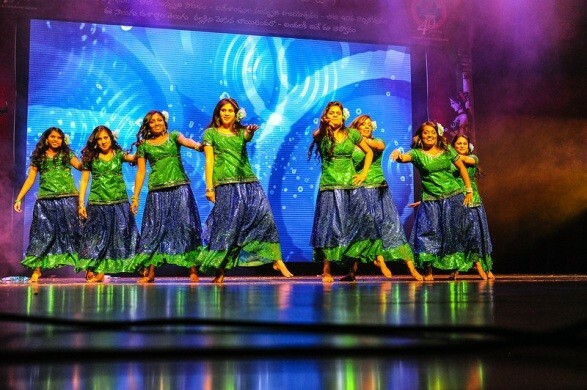 The other highlights of the evening were “Kolavaride Deemthana” was a grand sizzling fusion dance extravaganza with classical flair added by “Brahmanjali Kuchipudi” dance by Madhuri Kishore School of dance, and semi-classical touch given by “dheemthana” group, topped with foot-tapping dance “Nilapuri gajula” and rounded off to glorious ending with hip-hop Tollywood Dhamaka by Gurus of Dance. 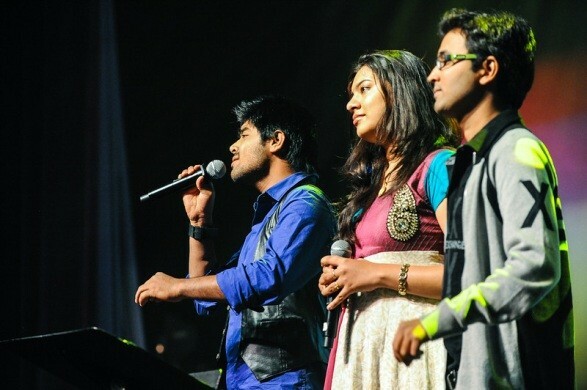 The Grand Finale was a musical concert by popular Tollywood singers SriKrishna, Geeta Madhuri & Revanth. The award winning singers made the program very entertaining with witty comments and singing hit songs one after another. It included classic hits like “Himagiri Sogasula” to the latest hit “Saar Vasta Vasta raa”. Towards the end of the program, the new committee for the year 2012 was introduced. Speaking on the occasion the out-going president Srinivas Kolli who thanked everyone for their support during his tenure as the president and thanked all the volunteers who worked very hard in making the 40th anniversary a grand success. He then introduced the new President Dr. Ramesh Konda. Speaking on the occasion newly elected BATA president Ramesh Konda said he is very excited to lead the team and congratulated all the volunteers in making 40th anniversary celebrations a milestone in BATA history. The sumptuous lunch and dinner at the event was another major highlight of the program. More than 16 local restaurants came forward and served the food. It was a full course meal with Telugu bhojanam with sunnundalu and bobbatlu. Dr. Indira Reddy, Upendra Reddy, Jayaram Komati, Prasad Vasireddy, and Yaswanth Kudaravalli have overseen the food arrangements both at Banquet and the main event. The Food sponsors include Suraj Restaurent, Swagat Indian Cuisine, Peacock Indian Cuisine, Swathi Tiffins, 8 Elements, Ananda Bhavan, Arka Restaurent, Andhra Bhavan, Chaat Bhavan, Dosa Biryani, Dosa Place/Fusion 9, Masala Grill, Our Place, Sneha Restaurent, Dosa Bawarchi, and Taste Buds. There were over 100 volunteers who had put in countless hours during the past two month with relentless effort and great passion to make this event a grand success. BATA Committee would like to thank all volunteers, sponsors, well-wishers and the guests at the event for the great support and encouragement. To list some of the volunteers, Veeru Vuppala, Hari Chikoti, Srikar Boddu, and Subbarow Chennuri have took care of sound, backdrops, banners, and auditorium; Jhansi Thiruveedhula, Kalyani Chikoti, Surekha Shetty and Durga Kondal took care of decorations; Vijaya Aasuri, Srilu Veligeti, Sridevi Pasupuleti, Jyotsna Bendapudi, Taraka Deepti, Kalyan Kattamuri, Shiva Kada, RatnaPandian, Aparna, Shruthi and group, have choreographed dances and plays; Karun Veligeti took care of hospitality for the guests and artists who came from India; Srinivas Pinapala led the Banquet; Rajesh Chavali coordinated the Youth Talent Show competitions; Ramesh Chindam conducted Art competitions at the event; Srikar Boddu and Murali led the Photo competitions and photography; Entry tickets for the event was coordinated by Satheesh Pola, Venkat Maddipati, and Suresh Sivapuram; Kondal Komaragiri took care of security; Srinivas Kolli provided leadership and fundraising; Ramesh Konda worked with Sponsors and Stalls; Kamesh Malla managed the finances; Ravi Thiruveedhula reached out to all past committee members; Sumanth Pusuluri, Yaswanth Kudaravalli , Srinivas, Vihar, Shiva, Vikas, Murty, and Ashok took care of publicity; Prasad Mangina and Gorti Brahmanandam have put together the souvenir; Dr. Sireesha Battula coordinated the Health Fair at the event; Srinivas Malyala from TV9 coordinated publicity on TV9; and Brad Behnke covered the publicity on most popular radio station “Desi 1170 am” in the Bay area. In appreciation to BATA’s services, there was a huge support from the many businesses in the form of sponsorship. Ravi Tax Services and Remit2India.com were the grand sponsors of the event. The Platinum Sponsors include Swagat Indian Cuisine and Peacock Indian Cuisine. Gold Sponsors were Channel Real Estate & Mortgage, You Smile Dental (Dr. Vuppala), G&C Global Consortium, LIC for NRI’s (www.anandjeevan.com), Service Oriented Solutions, and Shriram Properties. There several Bronze sponsors that include Scopus Consulting Group, ChimataMusic.com, Srujan Technologies, Shree Jewelers, Shree Travels, Dish Network, International Technological University, Rootshell Technologies, Swara Music Academy, Dr. Kishore Narra, Wells Fargo, Aptiva Corp, State Bank of India, PNG Jewelers, VisitorsCoverage.com, and UBS. The Media Sponsors that were recognized on the stage were Desi 1170, Virijallu, TV9, Telugu Times, GreatAndhra, TeluguOne/Tori, Sulekha, eKnazar, India Parent, 123Telugu, and NamastheAndhra. BATA secretary Ramesh Konda, invited all the sponsors, food sponsors & media partners on the stage and the BATA committee presented the 40th anniversary special commemorative momento to all of them and thanked them for their continued support.